Jeremy Meek’s super-rich girlfriend Chloe Green is worried that he might go back to his ex-girlfriend. Check out the reason why. 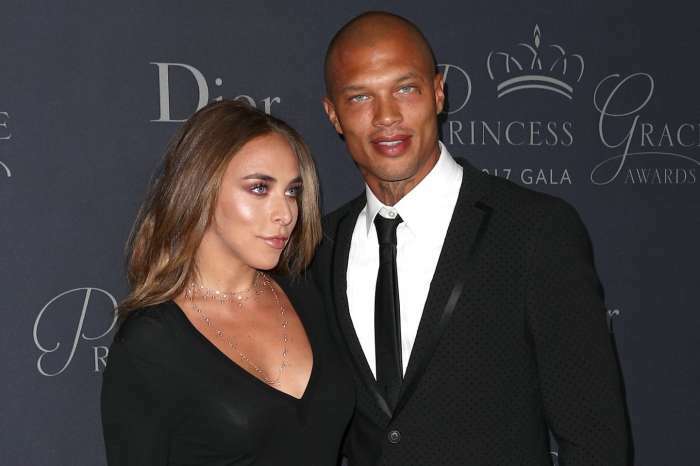 Not long ago, Jeremy Meeks was a married criminal, but life has changed for him. Now he is traveling around the world with the billionaire heiress Chloe Green. As you might have heard by now, his ex-girlfriend, Melissa Meeks, has recently undergone a vaginal tightening surgery. According to some sources that have spoken to HollywoodLife, it seems that Chloe is nervous that Jeremy might get lured back into a relationship with his ex. ‘These days Jeremy pays zero attention to what Melissa does — because quite frankly, he doesn’t care–he’s got his eyes on the prize, not his past,’ a source close to Jeremy said. ‘Jeremy is totally focused on Chloe, 24/7, and that’s how she likes it. Chloe has an insane jealous streak, and she keeps a very tight leash on Jeremy, she would not be happy if she discovered him talking or texting with Melissa, no matter what the reason was,’ the source revealed. Jeremy filed for divorce from Melissa on October 5, so it is complicated to imagine that after taking such a huge step to finalize their marriage, he would go back to her. So, Chloe might be wrong after all. IMHO…Jeremy has always been about the money. In most cases, money is the driving force behind crime, and as others have said, money can make the worst situations comfortable…for a time. That dog collar gets real tight after a while. If Chloe wasn’t a billionaire heiress, Jeremy probably would not have looked twice. She wanted to lay claim to and romp with a bad boy that many women were fawning over (her ego), and he is all about the money, and lavish lifestyle. Chloe knows it, too. She has kept him very busy, and still for all her wealth felt it necessary to permanently attach him to her for life with a baby. Well, sometimes you get what you asked for only to regret it. It is already apparent that neither of them has any shame. Both have ugly hearts….and Jeremy’s bright future and likability is running low on gas. Chloe should wise up and not marry that gold-digger. She is the one who will end up paying alimony. Jeremy should slow down and put some money away for his retirement, which may come much sooner than he thinks. The same industry that has used him solely for his looks, will discard him like the wrapper on a candy bar once it has been devoured. His personality isn’t offering much of a buffer on the way out. Karma won’t overlook him or Chloe. It is a sad life to never truly know who your real friends are unless you hit rock bottom. Jeremy used to have that. Certainly those he dissed on the way up will remember that when he falls back down. As for Chloe, at least she has a child whose love she can trust. It will be of great comfort now that the world has witnessed her true sense of entitlement, and unseemly nature. for one thing he should go back to his wife! That’s not his girlfriend the new lady got it twisted she’s the girlfriend an the way she took him from his wife it’s not going to last anyway because now she wants to put a leash on him ? THE HEART DON’T LIE, YOUR MIND WILL PLAY TRICKS ON YOU. WHICH DO YOU CHOICE IS THE QUESTION YOU MUST LIVE WITH THE DECISIONS. LOL YOU ALREADY KNOWWWWWWWW MONEY DOESN’T MAKE YOU HAPPY BUT REALLLLLL COMFORTABLE DEAL WITH IT. HELL I WOULD LOVE HER TO, NEVER BE IN LOVE SHE BUYING MY LOOKS SO BE IT!